Here's why we think you should rent plastic bins from us (instead of buying cardboard) for your next move. 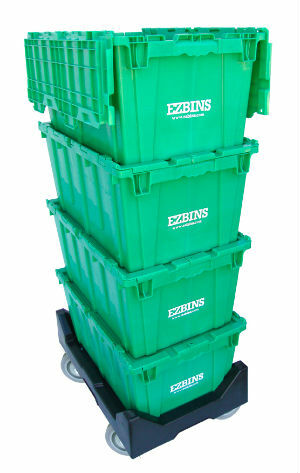 EZ Bins plastic moving bins are affordable and cost-effective. They are 25% cheaper than buying cardboard boxes, and we include free zip-ties, labels, and a dolly. We deliver the bins when you need them and pick up the empty bins when you’re done -- for free. Our bins speed up the moving process. They’re all the same size and safely stack on top of one another. This means you don’t have to spend time figuring out how to load your moving truck. There is no assembly required for these bins. As soon as you receive your bins, you can start packing right away. No time is wasted putting them together. We include free zip-ties and labels with each order that secure your items during transit and organized when you’re unpacking room-by-room. 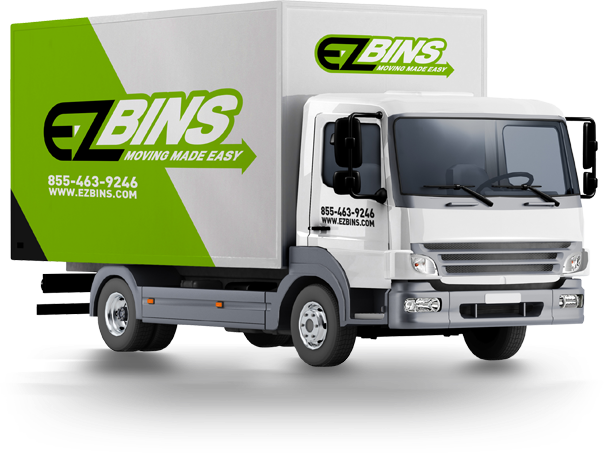 Using bins eliminates any damage that might occur during the move. Our bins are 20 times stronger than cardboard boxes and crush proof. Your items will be safe and sound, no matter what. Our bins are sanitized after every use. We make sure that each customer receives a fresh set of bins, so you can pack your clothes, bedding, and pillows with peace of mind. And, because our bins are plastic, it's impossible for bedbugs to nest or hide in them. Lastly, we care about you. We know how stressful moving can be and we will go that extra mile to make your move as smooth as possible. 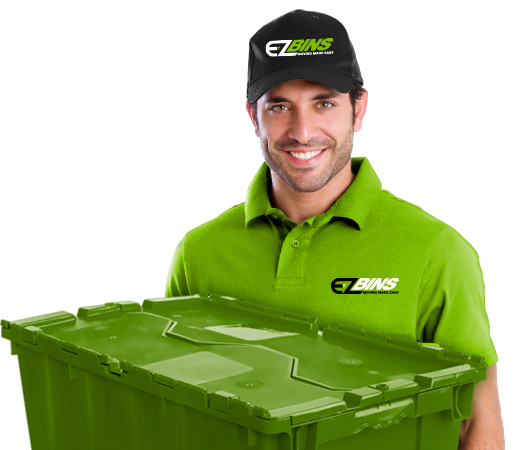 Thank you so much for visiting our website, we know you're going to love EZ Bins. Give them a try for your next move. 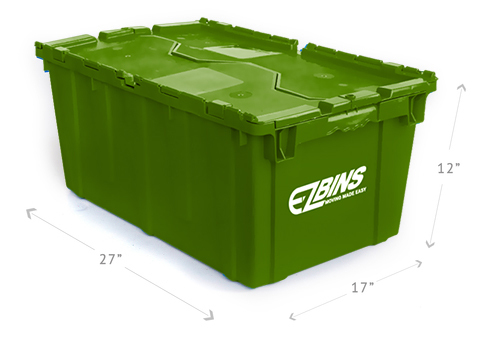 EZ Bins are all the same size keeping things simple and easy to carry when they're full. Bins stack, take up less than 3 cubic feet, and are easy to move around with Bin It dollies. 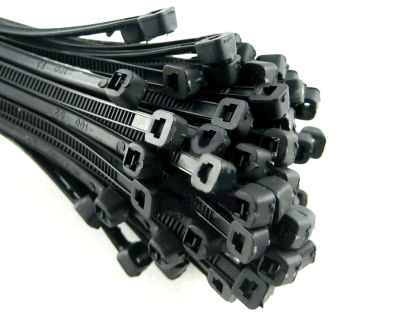 EZ Bins zip ties and labels keep your stuff secure during transit and organized when you're unpacking room-by-room. Get your bins quick - we just need 24 hours notice to make your free delivery. Our bins are reusable, which means that they help keep cardboard and plastic packing materials out of landfills. Plus, they're sanitized before each use, ensuring that your stuff stays clean. Pack Your Bin With Anything You Want! There are endless packing possibilities. Packages start as low as $60! Select your city to view pricing in your area. Enter your phone number below and we'll call you back asap!